Created by STLP student, Austin D.
WE ARE PROUD OF OUR NEW LOGO AND BANNER! The front office wishes you happy holidays and would like to tell everyone that "to please send in notes if you will be picking up your children early and absent notes when they return from being out." 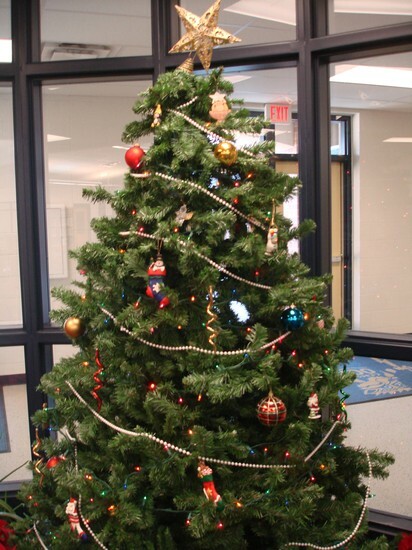 Happy Holidays from the CEMS Youth Service Center! Wishing everyone a very Merry Christmas and Happy New Year! If you are looking for things to do with your teens over break, here are a few suggestions! 1. Earn Spending Money. Although winter break isn't that long, many teens make a little extra spending money by babysitting, shoveling snow off driveways or helping others clean house after the holidays. These odd jobs will keep your teens occupied and make them less dependent on you for all of their expenses without making winter break one big chore. 2. Volunteer. There's no time like the holidays to give back to those in need. Local soup kitchens, churches, food banks and hospitals are always in need of a helping hand. Your teens can also get involved with a toy drive or adopt-a-family-in-need program, or raise money for a cause close to their heart. This is a great opportunity for the WHOLE family to get involved and spend time together! 3. Get Organized. In the past few months, hectic schedules and school stress have probably contributed to your teens' room looking like a jungle. As new gifts come in with the holidays, encourage your teens to donate the clothes, books and other belongings they no longer use. A thorough reorganization and cleaning will help ensure the next semester gets off to a good start. 4. Spend Time as a Family. The holidays are a busy time for everyone, but they're also an ideal time for family bonding. Schedule family game night or movie night, and make sure everyone makes it a priority to be there. If your extended family lives nearby, winter break provides a rare opportunity for your teens to get to know their grandparents, aunts, uncles and cousins a little better. Please remember that the Holidays can be very stressful and burdensome for many families, if you know of any one that could use some help during this time there are many resources available. Below is a PDF link of some resource agencies in Boone County. 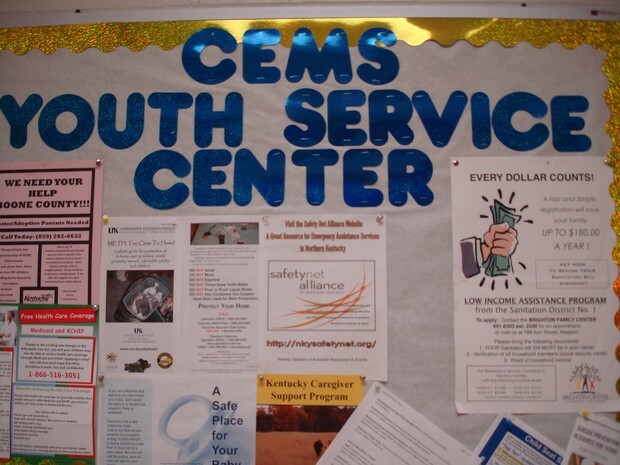 The Youth Service Center serves ALL the families of CEMS from basic needs, links to resources agencies and much more! Please feel free to contact me anytime! It’s always a great idea to keep personal copies of your student’s immunization record and physicals. 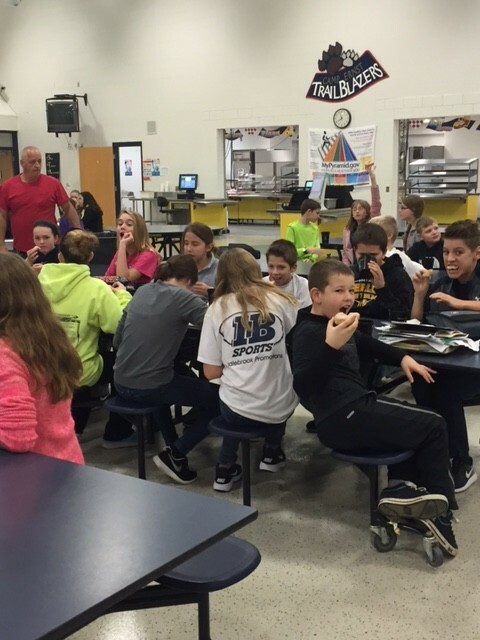 A preventative health physical is required in sixth grade. This is different than a KHSAA required physical for sports participation. Please keep a copy of your sports physical. Please practice good hand washing to prevent illness. 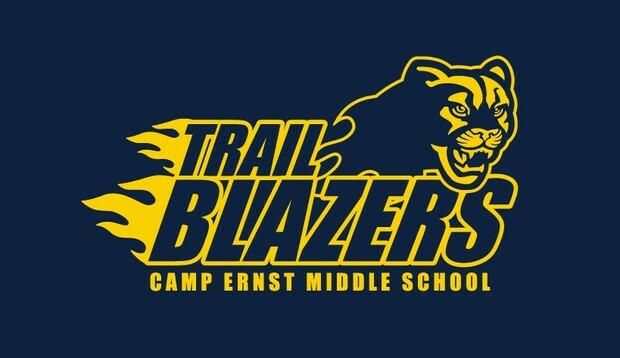 Basketball Season is now in full swing, with each Camp Ernst team off to great starts, especially the 8thGrade Boys and Girls, each is still UNDEFEATED. District play begins on Monday December 14th, as we take on the St. Pius Panthers, boys will be at St. Pius, girls at Camp Ernst. Come out and support your BLAZERS! 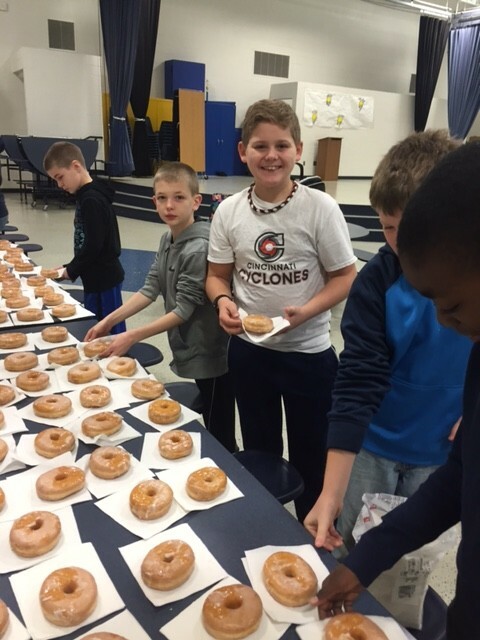 Camp Ernst Middle School and the PTSO hosted the first honor roll breakfast. 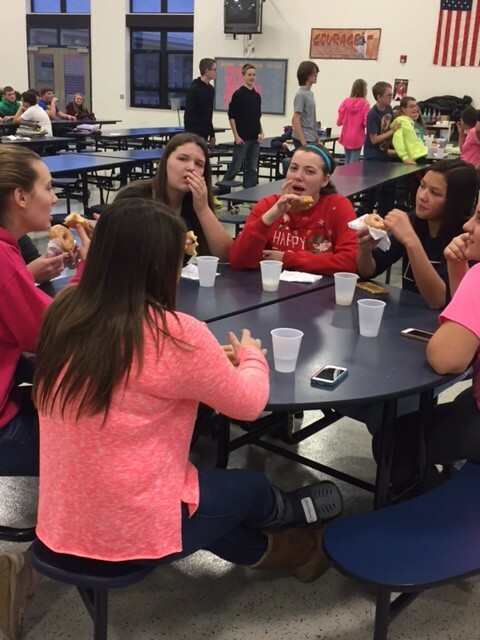 All A and A/B students were recognized in the cafeteria with donuts and drinks for all of their hard work!! Congratulations to all of them for academic excellence!! Thank you PTSO!! Please join us for our first Blazer Dads event! All Father Figures Welcome! Please RSVP at https://blazerdads12-11-15.eventbrite.com by Wednesday,December 9, 2015. Due to a successful fall Scholastic Book Fair the library was able to purchase 67 books. A wide variety of nonfiction and fiction books are now available in the library for checkout including titles Field & Stream’s Guide to the Outdoors, Mark of the Thief, Pittsburgh Penguins, and Into the Killing Seas. The Spring Scholastic book fair will be held Jan. 22 – 29, 2016. All proceeds will go toward purchasing more books for the CEMS Library. To “care” for someone is one of the strongest commitments that one person can make. To be “cared for” is one of the most powerful actions and words in a child’s life. Children often speak about how no one cares for them or about them. They feel lonely and isolated and not valued. Caring for and about children is at times difficult work but it does make a difference in their world. The holidays often put added stress on adults which in turn trickle down to those around the adults. Take a moment and find your balance so a child does not feel the confusion of misdirected anger. Children should be able to depend on the adults in their lives to be honest and fair about what is happening on a daily basis. Listed below are powerful interventions that can make everyone’s holiday season more meaningful. Commitment: Young people crave something to belong to. Once we become significant adult in their lives, we have made a commitment to being there for them, even when the going gets tough. Altruism: By the nature of our commitment to children, we have to learn to love them unconditionally. We understand that the power of being an adult that likes you even when you’re bad is a healing power. Respect: We understand that the children in our lives deserve not to be put down, abused, or manhandled. We don’t “dis” those that we are responsible for by saying or doing mean things. Effectiveness: We understand that changing one life may not be efficient, but it’s worth it. We accept the fact that we may have to use a lot of our time, energy and resources to turn one child’s life around. As Ellen DeGeneres says every day at the end of her show, “take care of one another, and be good to one another” It really is that simple. Just sending out a little note to let you all know that I was in several classrooms today that were actively engaging kids! I observed all sorts of happenings, including a claim in an ELA class that "magazines promote unhealthy habits in girls", so I asked him (student) to support his claim and he answered, "They think they have to wear make-up". I wondered if he thought about what someone wearing make-up might think of that answer...hmmm. The point is, he supported his claim with other types of evidence. I was able to see kids prepare for a quiz in a math class. The enthusiasm that radiated from the teacher caused excitement in the kids and was truly inspiring! They solved an equation together (teacher and students) and took risks answering out loud because they aren't afraid to be wrong-because the teacher creates a warm environment that allows students to feel confident to answer, even if they're wrong! That is a growth mindset!! We fail first in order to succeed! As I am just about to leave for the weekend myself, I see many teachers still trickling out of the building at this late hour on a Friday...the dedication of so many people in our building astounds me daily. 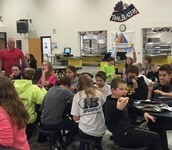 CEMS is a great place to be!! !